Academic historians are used to thinking of historiography as something one finds in old books. You know: "Back in the 1800s historians understood the causes of Civil War to be A, B and C, as we see in books D, E, and F. By the 1960s however, historians though that G, H, and I were in fact the cause, as we see in the works of J, K, and L." Outdated interpretations are sentenced to the darkest recesses of the library, where books that were once the belle of the ball are shuffled off to long-term storage. In the case of public history, however, those old volumes are not always volumes. They are more often museum exhibits, or historical markers, or even entire public history institutions that date their creations to very specific historiographical moments. And what historians thought they knew about the past in those founding eras can continue to shape and constrain how that history is taught to the public. I got to thinking about this as I was cleaning up some digital files and found a copy of the old visitor center film used at Whitman Mission National Historic Site. So here it is. Created in 1976 and used until only a few years ago, the film is an interesting historical document. Also, racist. A few years ago I gave a paper at the National Council for Public History titled The Many Deaths of Marcus and Narcissa Whitman. In that paper I divided the historiography of the killings of the Whitmans into four periods: 1) The Era of Blame: 1847-1880; 2. The Era of the Redeemer: How Marcus Whitman Saved Oregon, 1880-1940; 3: It Was All a Big Misunderstanding 1940-1980; and 4. The Whitmans Had it Coming: 1980-present. The first era interpreted the killings in an effort to pin the blame on someone, preferably Catholics, though mixed-race persons such as Joe Lewis were also handy targets. The second era focused on the Whitmans as pioneers of white settlement rather than missionaries in an attempt to recover some meaning from their otherwise senseless deaths. The third era emphasized the cross-cultural misunderstandings in an attempt to bring the native point of view at least partially into the story. The current era of historiography (which I have perhaps named unfairly) focuses on the Whitmans as the agents of empire that they were and frames the actions of the Cayuse as self-defense. 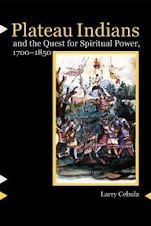 My book, Plateau Indians and the Quest for Spiritual Power, represents the most recent understanding, as does the new film at the mission that I shared last week. This older film, though produced in 1976, represents the second stage of interpreting the Whitmans. They are representative of the white pioneers who "helped carve a nation from a wild and beautiful land." The Indians who met Marcus were "inspired by his spiritual zeal," though they showed "little aptitude for farming, and little more for the gospel." The Whitmans are significant not for their missionary work, which was a failure after all, but for their farm, their gristmill, their publicizing the Oregon Territory to eastern settlers, and for converting their mission into a way station for the Oregon Trail. Why does an understanding of the Whitmans that fell out of favor in the 1940s appear in a 1976 film? It is because the national monument itself is dedicated to that interpretation. Established in 1936, Whitman Mission was molded from its inception by the Marcus Whitman Saved Oregon Story. And though the Park Service has struggled at times to distance itself from this narrative, the very layout of the park reinforces this interpretation. The creation of Whitman Mission was part of a larger effort by the NPS in the 1930s to expand its mission from protecting wilderness to protecting and interpreting historic sites as well. At Waiilatpu the Parks Service found not a blank slate but a site that had been interpreted for decades, an interpretation firmly wedded to the "Marcus Whitman saved Oregon" story. The Park Service slowly expanded and built up the infrastructure and interpretation at the site through the 1940s and 50s. The master narrative of the Whitmans as civilizers determined what kinds of improvements and interpretation took place. NPS employees cleared out the weeds and marked the outlines of where the mission once stood. The Whitman’s mill pond was recreated, and interpretive stops showed visitors the sites of the former gristmill, blacksmith shop, and irrigation ditches. Much was made of the fact that the Oregon Trail ran through the mission grounds, and the wagon ruts were maintained by regular applications of herbicide. A pioneer cemetery was cleared of weeds, and several headstones of people not related to the Whitmans were removed, to focus the story. An adjacent Indian cemetery was ignored. “By their life and death the Whitmans symbolize the noblest in the spirit and endeavors of the pioneers,” wrote regional supervisor Olaf T. Hagen in the first interpretive prospectus for the park. It was added that “the life and culture of the native Indians will be presented as a background.” Park administrators did periodically notice the lack of information about the Cayuse—who were after all the vast majority of people living on the site in 1847—and sometimes they thought about doing something about it. “We have very little Indian culture references in our library,” one superintendent wrote, explaining that the park could not interpret the Cayuse because they did not know anything about them. From the 1950s well into the 1980s the park had only the slightest information about the Cayuse peoples. In recent decades a series of superintendents and staff have worked hard and vastly improved the interpretation, with a new film, new visitor's center exhibits, and improved interpreter training. But at the end of the day, when people walk outside of the visitor's center, they are presented with a mill pond, a covered wagon, the outlines of pioneer buildings, and a soaring granite obelisk atop a hill. It is a historiographic lesson written on the landscape and carved in stone. Outstanding assessment. It's about time for historians to quit parroting the old soap about the Whitmans being great civilizers and protectors of the Native American people. This is such a good survey of past and continuing interpretation efforts. At least we 're (Park Service, society) going in the right direction. There is some indication that the Whitmans reneged on their rent check, a proximate reason for their unpopularity. Is it as simple as that? No. The dualing colonial powers had their pawns on the table, the HBC post with its trade goods was just downstream, and lets not forget, the Whitmans made good use of the Metis who à la façon du pays had become steadfast partners locally, deeply rooted in their ties to Christendom of another flavor. These competing forces set the stage for tragic consequences. Lets not forget too, the Cayuse were much different than the Walla Walla culturally. The Cayuse were the local divested owners whose land and resources were co-opted, not particularly knowledgable of disease vectors and western medicine. Truly complicated.